In 2016, SJF Ventures undertook a project to better understand the climate change impact of its portfolio. 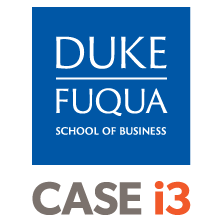 SJF worked with a team from CASE i3 through the CASE i3 Consulting Program, along with its partners at the Duke Carbon Offset Initiative and with review by the Environmental Capital Group, to create a dynamic model illustrating how and where SJF’s portfolio companies reduce carbon emissions. With this report, SJF’s annual carbon mitigation impacts are now being quantified and aggregated at the fund level, and SJF is excited to be one of the first venture capital firms to study and report on the carbon impact of its portfolio. Read the project report on SJF’s Impact site here. This entry was posted in CASE Publications, News and tagged climate, energy, i3CP, impact measurement, performance, private equity, students. Bookmark the permalink.